Found this vintage pair of vintage craps dice while playing games new year's eve. 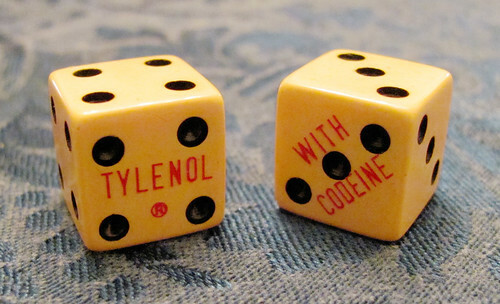 It took a little while to piece together the orginal use of the dice as part of tylenol's marketing campaign with doctors to boost awareness/prescriptions of the codeine variety which was launched in 1963. Take our meds and come up a winner every time!